Free estimates on all tree service jobs Richmond, VA and the surrounding areas. area. Call us today for your free quote! 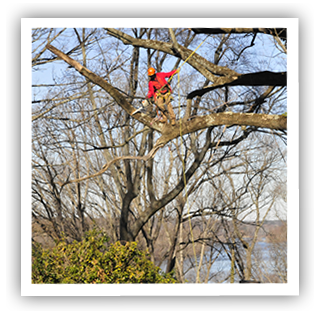 Our ISA Certified arborists perform tree removals in Richmond, Virginia and the surrounding areas. We provide free quotes on all jobs. Ridgeline’s professional pruning & trimming services aim to safely improve both the health & appearance of your trees. Extreme weather in the Richmond area? Our highly experienced team safely & efficiently cleans up your storm damage. We offer a full range of tree services in the Richmond metro area. Call (804) 378-2900 for more information. Ridgeline Tree Service is an ISA Certified tree service company in Richmond, VA with highly-skilled arborists who can help with all of your tree care needs. Surrounding areas also served: Bellwood, Bensley, Bon Air, Chamberlayne, Dumbarton, East Highland Park, Glen Allen, Henrico, Highland Springs, Lorraine, Mechanicsville, Midlothian, Sandston, Short Pump, Tuckahoe, Varina & Wyndham. Don’t see your town on this list? Call us! With over 25 years of experience in the field of urban landscaping, our dedicated team of professionals offers proactive assistance through preventative maintenance with a minimally invasive approach. Fill out the form below for a free quote from Ridgeline Tree Service in the Richmond, VA area. 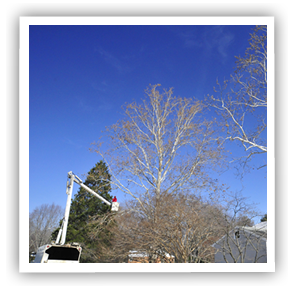 Ridgeline Tree Service prioritizes tree removal in Richmond, VA as one of its most important services. The decision to remove a tree is not one to be taken lightly – by the homeowner/business-owner, or by the arborist you hire to do the job. That’s why Ridgeline is passionate about not just being a team of people with power tools. We are diligent students of the trade, constantly striving to improve our tree and stump removal practices. Step One: Call us for a free estimate at (804) 378-2900. We’ll come out to your Richmond or surrounding area property (residential or commercial) and provide a completely complimentary consultation & quote. Cost for removing your tree or tree(s). Service options for affordability/budget flexibility. The process we’ll adopt for performing the removal. Other suggestions for current or future tree service needs. Step Two: After our consultation & estimate, you may choose to hire us for your tree’s removal. In that case, we’ll work with you & your schedule to find an appropriate time for us to come out and do the work. You may choose to be present for the removal, or we can come while you’re out. Either way – it’s our job to make sure you are a completely satisfied customer by the time we’re done. Don’t hesitate to contact us at Ridgeline Tree & Landscape Development, LLC with any questions you have about your tree removal needs. Our next critical service offering is our Richmond tree trimming service. Our pruning arborists are fully trained in ISA certified techniques, and of course – we offer free estimates before a single piece of equipment touches your tree. Our customers hold our tree pruning team to an extremely high standard, both in tree health & aesthetics, due to the reputation we’ve built in Richmond for being the go-to arborists for trimming. Step One: Simply give us a call (or use the form on this page) to get your free estimate: (804) 378-2900. One of us at Ridgeline will visit with you & inspect the trees you would like serviced. Step Two: If you choose Ridgeline Tree & Landscape Development, LLC as your tree trimming arborist, we’ll schedule a time for the work to be completed. Once again, you can choose to either be present while we work, or we can come out while you’re away. Our trained staff will be able to complete the pruning with or without the homeowner/business-owner present. Contact us today at Ridgeline for a free consultation on your tree pruning & other service related needs. At Ridgeline Tree Service, we pride ourselves in implementing a fully personalized approach to our clients’ individual needs by bringing you a service unmatched in quality and price. From visiting your property and evaluating your project, to diagnosing problems, implementing solutions, and removing all debris, our exacting standards ensure you receive the assessment and tree service most suitable to your needs. We work closely with clients to build a strong foundation and on-going relationship, where we take into account your personal preferences, requirements & expectations. Ridgeline Tree Service is a fully-insured Virginia Class A contractor #2705 125089A. We are also certified by the International Society of Arboriculture (ISA) #MA-5341a, and hold a long list of credentials and references to vouch for our excellence and reputation. Our clients’ safety is our top priority, and we strive to quickly mitigate any potential hazardous situations that need to be promptly addressed. A knowledgeable and helpful member of our team is always just a phone call away and ready to assist you. For emergencies please call (804) 378-2900. We are available 24/7 to answer any questions you may have to help you create the comfortable, beautiful and self-sustainable outdoor environment you have always dreamed of. At Ridgeline Tree Service, the core of our business are our clients, and we work round the clock to provide you (our client) with prompt professional service that is unmatched by our competitors. Enjoy personalized service and solutions that are tailored to your personal preferences and unique outdoor space requirements. Our efforts lie in bringing the best out of your property through a careful combination of technique, available resources, and reliable know-how gained through our years of experience. Get in touch today for a free estimate on your Richmond tree service needs. Our team will diligently, kindly & efficiently put all of our resources to work to deliver you an unparalleled customer service experience. Our environmentally-sensible approach guarantees you will receive the least invasive tree care, specifically developed by ISA certified arborists. We are passionate about what we do and will always go that extra mile to ensure our clients get their money’s worth in providing them with a fast, efficient & courteous service.